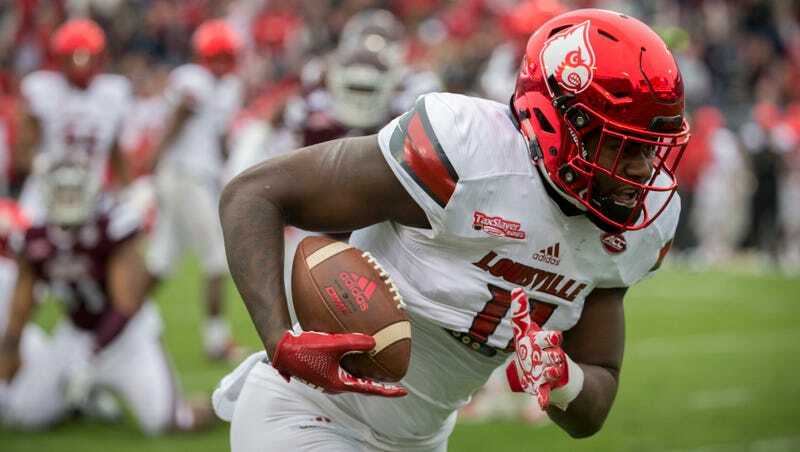 Louisville sophomore tight end Kemari Averett was suspended from the team today after being arrested and charged with first-degree wanton endangerment and fourth-degree assault. Averett is accused of grabbing his girlfriend’s hair, putting a gun to her head, and threatening to kill her because he thought she had stolen his laptop. He is currently being held in a Louisville jail on $10,000 bond. The police report refers to Averett as the father of the alleged victim’s baby, though he apparently denies that he even knows her. According to the report, Averett went over to her house to study on Sunday night. He left his backpack there, and after she returned it, he noticed that his laptop wasn’t inside. That’s when he apparently approached her in her car and made threats on her life. Averett then told her to return to her hometown, and “I’ll have my people looking for you,” police said. He also told a witness in the back seat that, “I should pistol whip your (expletive) for running your mouth,” the citation said. Averett was indefinitely suspended from the team today, and coach Bobby Petrino noted his efforts to “develop a culture of accountability that everyone in our program must live up to.” Averett, who has two touchdowns this year, pleaded not guilty, and his next court appearance is scheduled for Oct. 26.